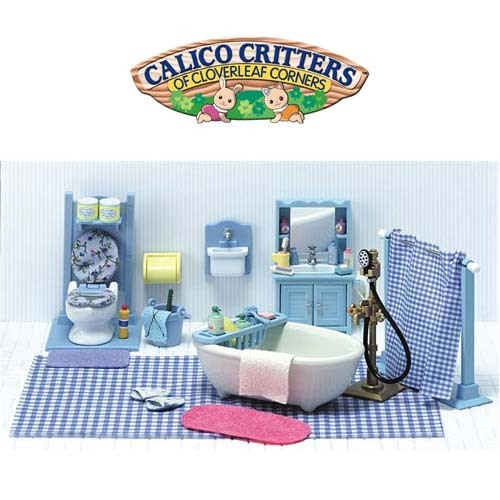 From the tiny roll of toilet paper to the ceramic bathtub, this Calico Critters Bathroom Set has realistic looking miniture items. The set includes a ceramic bathtub and toilet, shower stand, vanity and sink. In addition to the larger items there are 30 tiny accessories: rug, shampoo, soap, toothbrush, slippers, and more. This set will bring hours of creative play for your child(ren). This set is designed to furnish the Calico Critters Charming Country House (sold separately). From the tiny roll of toilet paper to the ceramic bathtub, this Calico Critters Bathroom Set has realistic looking miniture items. The set includes a ceramic bathtub and toilet, shower stand, vanity and sink. In addition to the larger items there are 30 tiny accessories: rug, shampoo, soap, toothbrush, slippers, and more. This set will bring hours of creative play for your child(ren). This set is designed to furnish the Calico Critters Charming Country House (sold separately). For 3+ Years old.